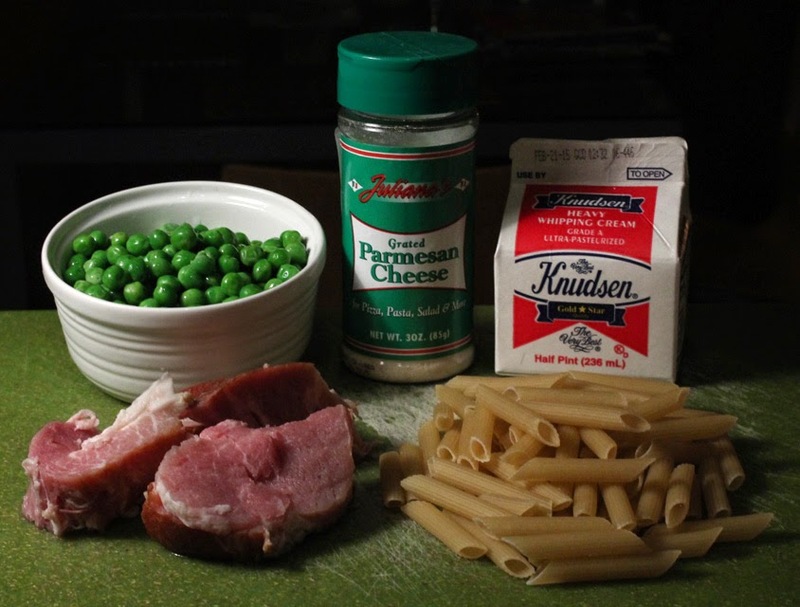 If your arteries are clogged, then stay away from The 99 Cent Chef's decadently rich Ham, Peas & Cream with Pasta. Oh, what am I saying, go for it, you can exercise later! 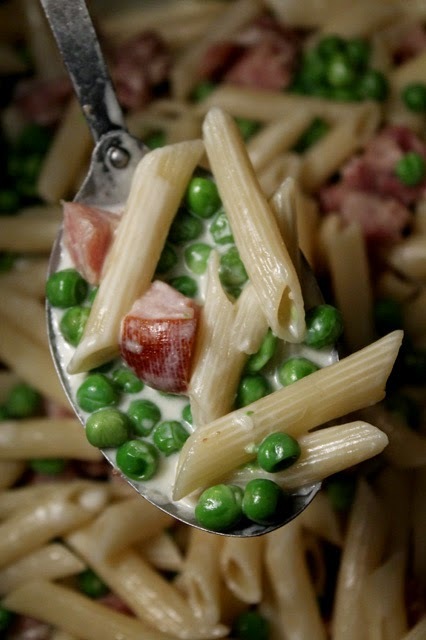 My recipe is similar to a creamy Fettuccini Alfredo, (my appetizing recipe video is here) but, with the addition of bite-sized pieces of lean ham and tender peas. 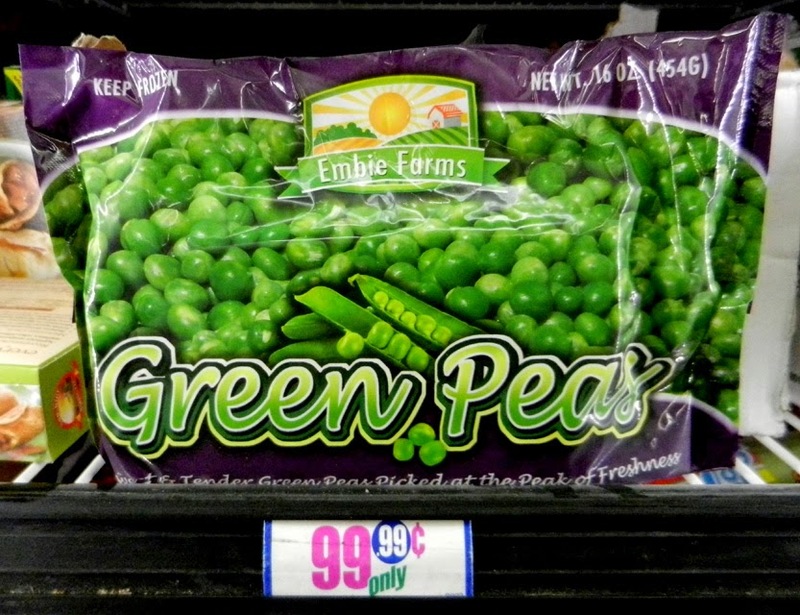 I use a package of frozen peas that I get cheaply almost anywhere. 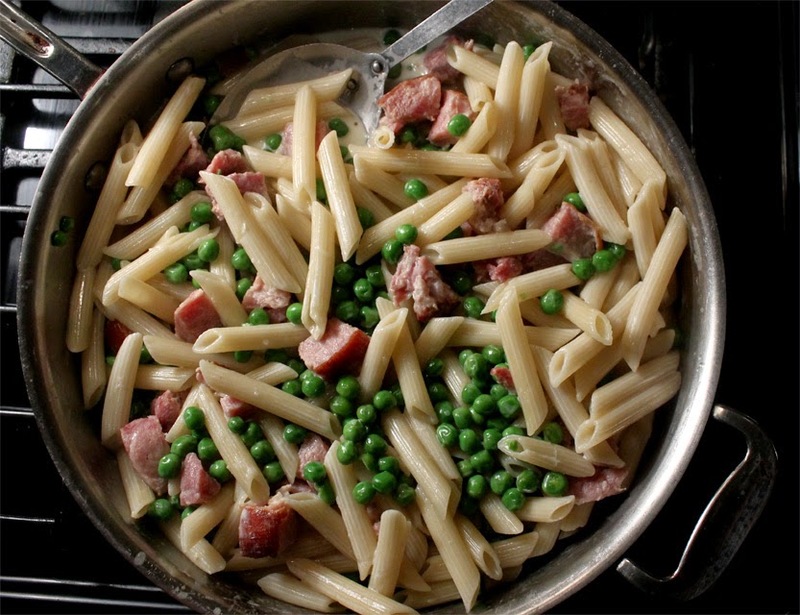 If you can find fresh peas, then use them. But, don't use canned peas, as they will quickly turn to mush. You can defrost frozen peas in a microwave oven, but be careful not to overcook them. It's quick enough to finish defrosting them in the frying pan as the cream simmers. 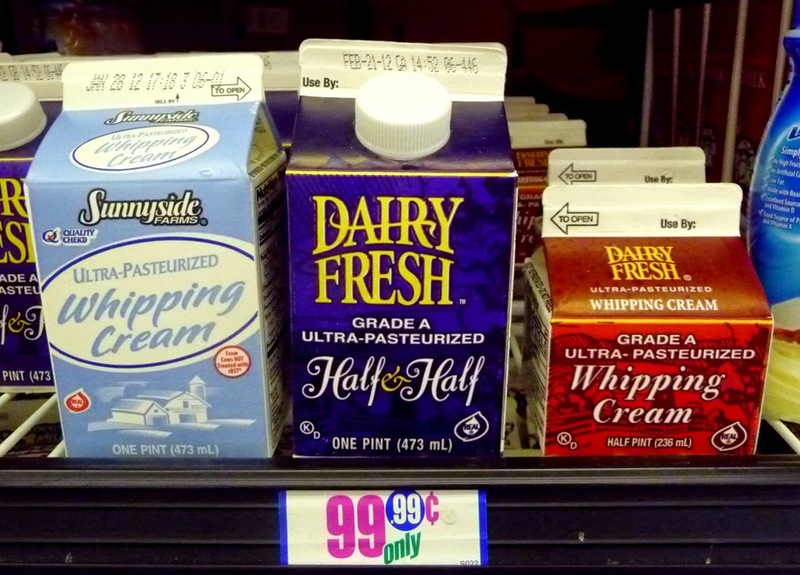 And, I'm lucky to find whipping cream, half and half, or even whole milk cheaply at my local 99c only Store. You won't be using too much, so, at whatever price it's worth it. But, you can go light and use regular milk instead of cream -- if you must. 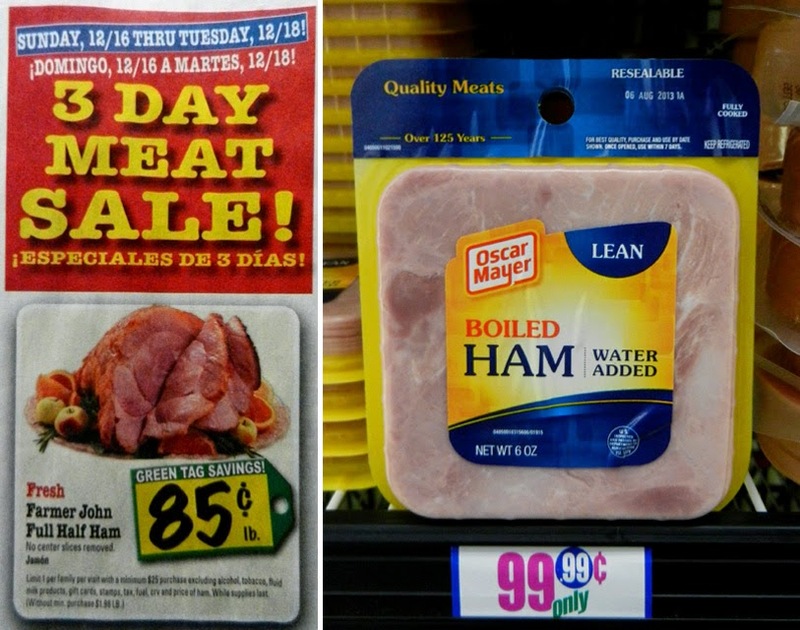 I always have hunks of ham in my freezer. When whole ham shanks come on sale during Thanksgiving and Christmas I get one and break it down into thick slices, for future use. 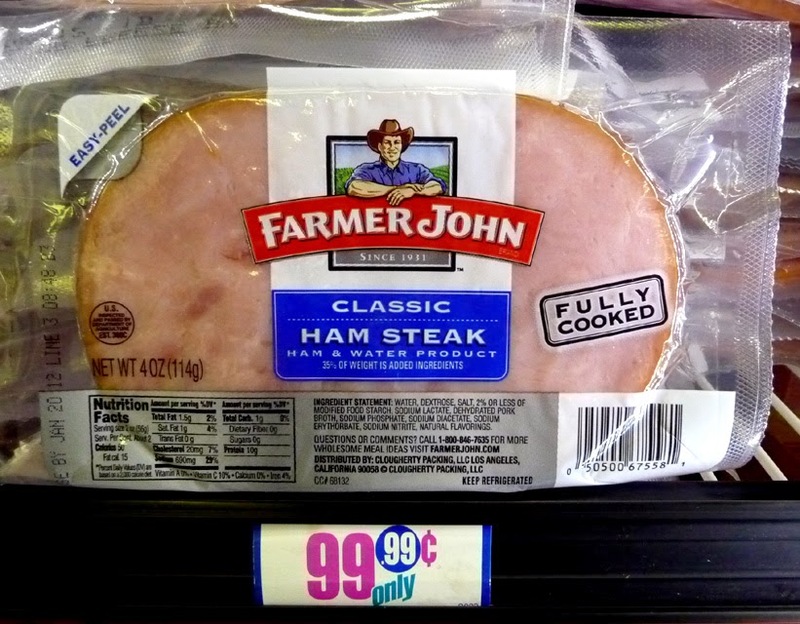 Of course, you can just get a single ham steak, or even use thin slices of deli ham, that's priced cheaply. This Italian pasta dish comes together quickly, as everything is already cooked -- you are just heating it all up, in about the time it takes too cook a pot of dried pasta. I used penne pasta, but you can use any favorite dried pasta you have on hand, like, spaghetti, or spiral and tube pastas. Dried pasta is inexpensive almost anywhere you shop for food. I don't quite use a whole package of pasta, so there is plenty of sauce to go around. If you want to finish off the whole package of pasta then just add another cup of milk, cream or half and half. This is one tasty cheap$kate recipe. 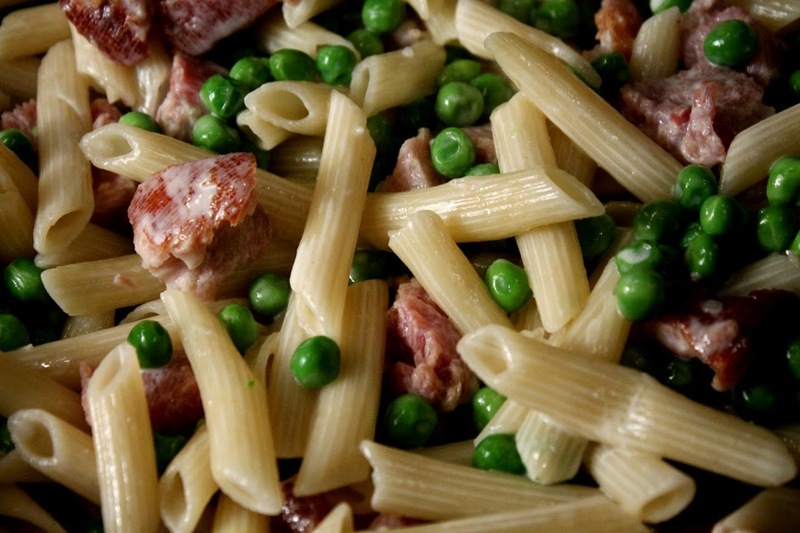 My Ham, Peas, and Cream with Pasta will have you back for seconds, so make plenty! 1/2 pound of ham - or about 6-8 ounces, cubed. Okay to use thin-sliced or thick. Add more if you like. 2 cups frozen or fresh peas - Canned are too mushy. 2 cups half and half milk - or equivalent. I used 1 cup of whipping cream and 1 cup of milk. Okay to use 2 cups of milk, instead of cream or half and half. You can add more cream or milk to taste, if you want more sauce. 8-12 ounces of penne pasta - or any favorite pasta. Okay to use spaghetti, tube or spiral pastas. 1 tablespoon parmesan - fresh shaved or dried. Optional. Pepper to taste - no salt, as ham and parmesan cheese have plenty of salt for me. Get pasta started. Follow package directions. 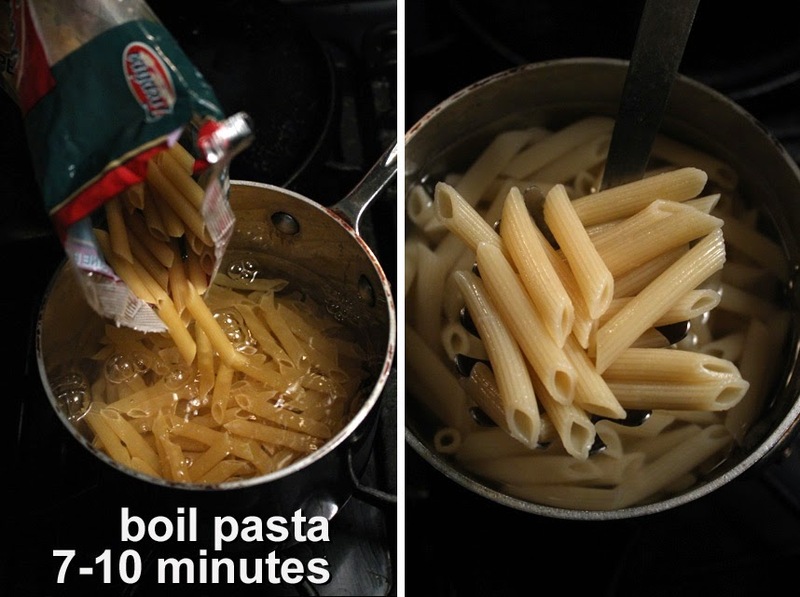 Simply boil pasta about 7-10 minutes. 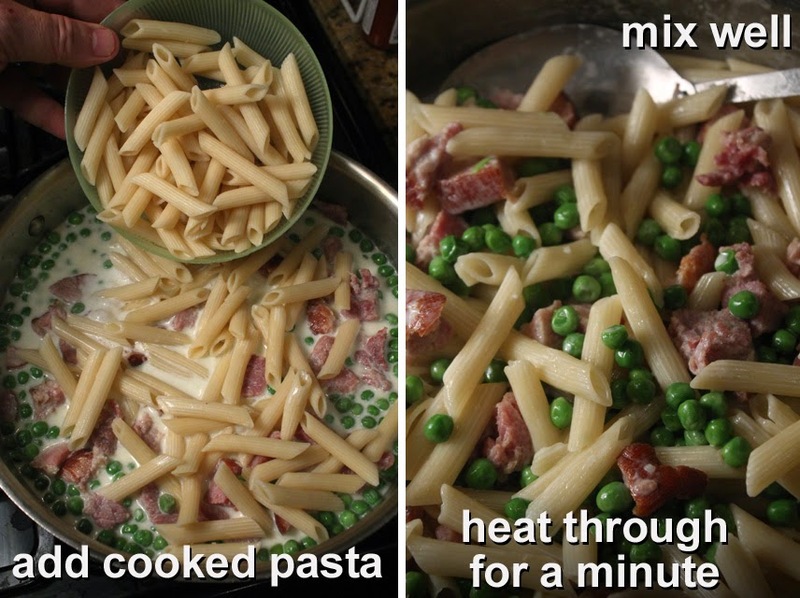 If pasta is ready before ham and peas cream sauce, then drain and cool it down. You can reheat pasta in the cream sauce. In large pan over medium heat add oil. Slice ham into cubes or shred it into bite sized pieces. Heat the ham through, about 3 minutes. 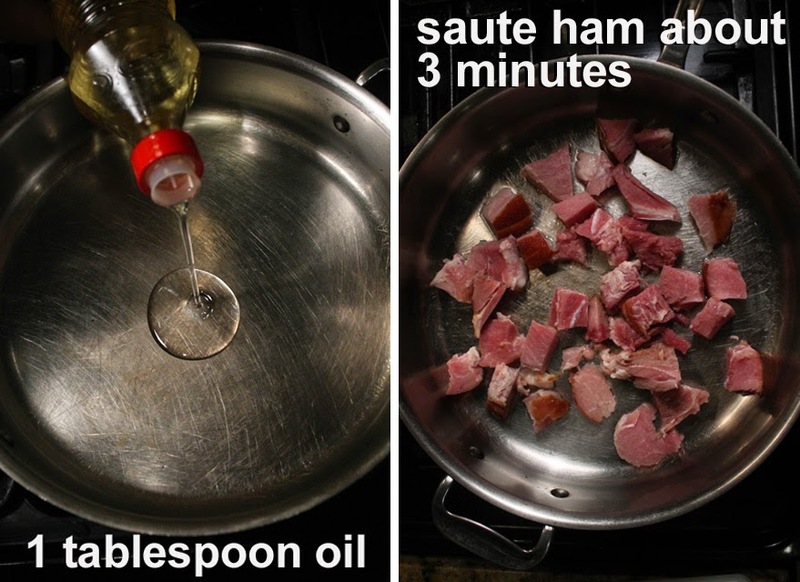 If you are using thin sliced ham, then heat for just a minute. Next add the frozen peas. 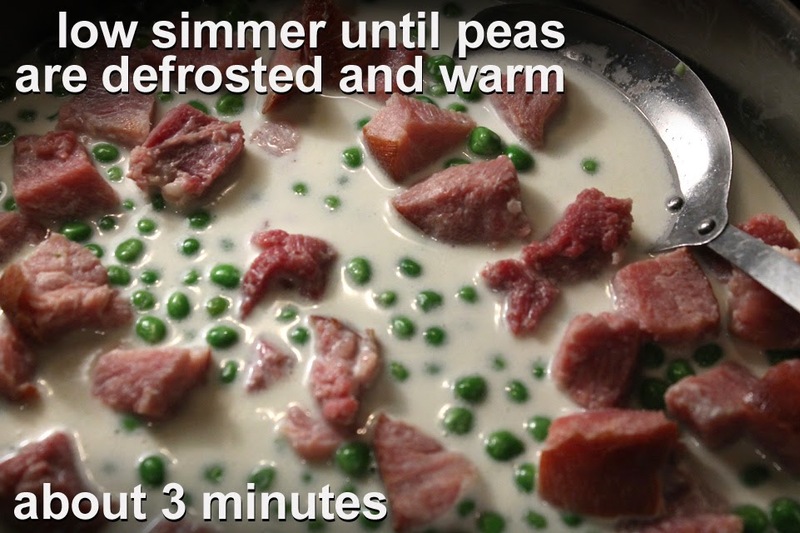 Or, defrost peas before adding them to pan to cut down on cooking time. Finally, pour in the cream, half and half, and/or milk. Season with pepper to taste. 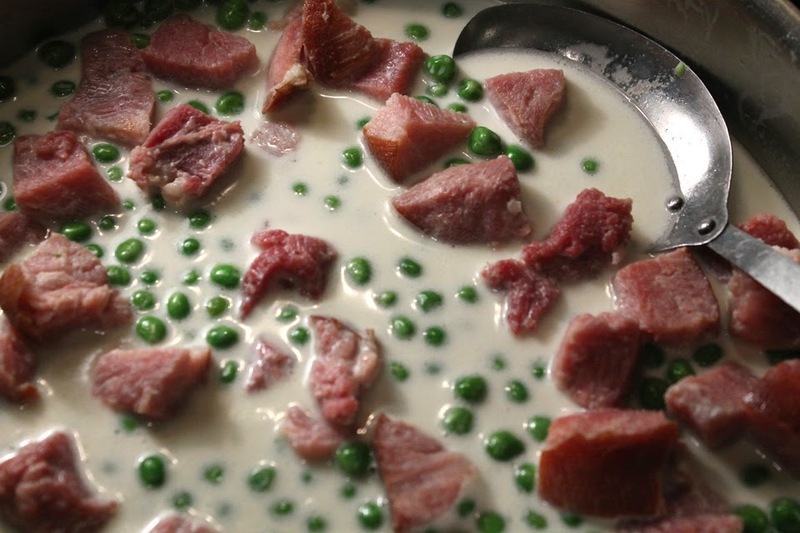 I find ham is salty enough for this entree, but add some if you like. Sprinkle in the dried parmesan. If the parmesan is fresh shaved, then add it to pasta just before serving. Stir and bring liquid to a low simmer. Cook until peas are defrosted and heated through, about 3 minutes. Be sure to try a pea to check for doneness. Finally, mix in the cooked pasta. If the pasta is drained and cooled down, then cook it in the sauce until heated through. All you need to do is heat everything for a minute or two. Pasta will absorb some sauce, so serve it as soon as it's hot enough. The pasta will be delish the next day, too. You can drizzle in a tablespoon of milk when reheating, if the sauce thickens too much by the next day. When I'm running late, or hey, just plain lazy, I'll throw together an Easy Marinara Sauce and cook some dried pasta. You can just buy a favorite jar of pasta sauce with all the ingredients; but I like to add a little fresh sauteed onion and garlic to mine. And if I have some fresh herbs (or dried) and leftover wine, then that goes in as well. Some recipes call for a little chopped celery and carrot, too. Pasta with Marinara Sauce is enough for a meal, but you can bulk it up with a sauteed Italian sausage, a can of chopped clams, or chicken; or even mix in an anchovy or two from a can - it's all good. And don't forget to top it with some dried, or fresh shaved, parmesan cheese. You can keep it vegetarian and add any favorite steamed veggies like: Italian squash, cauliflower, zucchini, broccoli, or a jar of any favorite marinated veggie, too. For extra flavor I use fresh herbs from my patio garden, but you can use any dried Italian herbs (or a premix). Tomato sauce is cheap at any grocery store. Sometimes I use whole or crushed tomatoes from the can - that makes it a rustic sauce. Just break apart the tomatoes as they heat up. You can use the sauce to top any pizza crust you make, or buy premade from the grocery store. (I would advise running the sauce in the blender for a few seconds to smooth it out.) 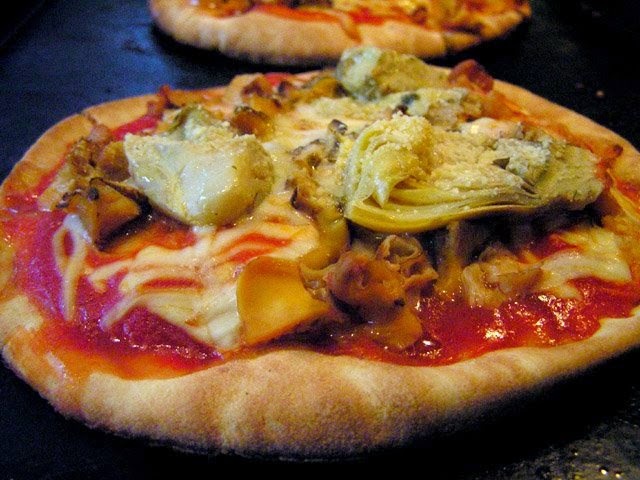 I have a fun Pita Pizza Recipe a click away here, that's perfect for my homemade Marinara Sauce. And type the word "pasta" in the search box at the top right side of this page and hit enter -- to see a bunch of my other cheap$kate pasta recipes. So, if that paycheck is running late and you're down to your last dimes, or just feel like keeping it simple, then cook up my cheap and Easy Marinara Sauce and add it to some inexpensive pasta.And bulk it all up with a favorite steamed veggie, or crumble in some sauteed Italian sausage. Play it here, video runs 2 minutes, 32 seconds. 1 15 ounce can of tomato sauce - any favorite brand, even from a jar. 1/2 onion - chopped. White or yellow is okay. 1 teaspoon garlic - chopped fresh or from a jar. 1 cup water - to clean out the tomato can, and add it to sauce. Okay to use red or white wine, or a favorite broth. 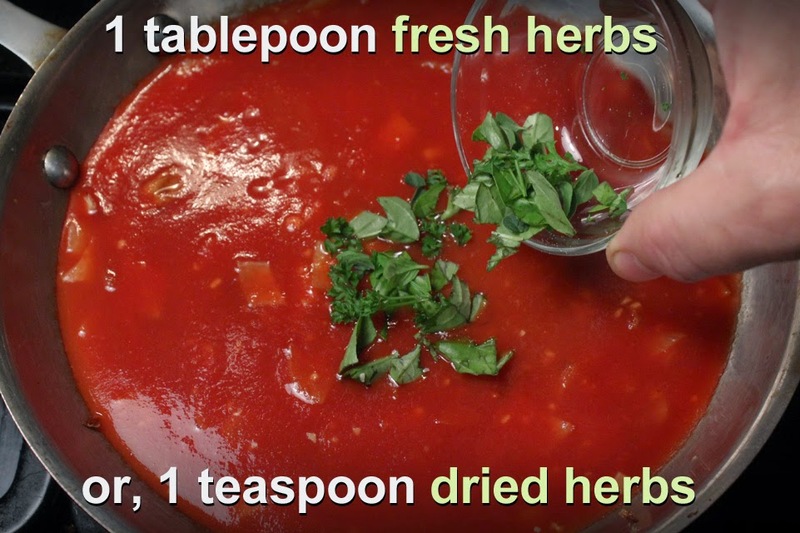 Italian herbs - about 1 teaspoon dried, or 1 tablespoon of fresh chopped. I used basil, oregano and parsley. Okay to use a dried herb Italian mix or any combination of dried you have on hand. 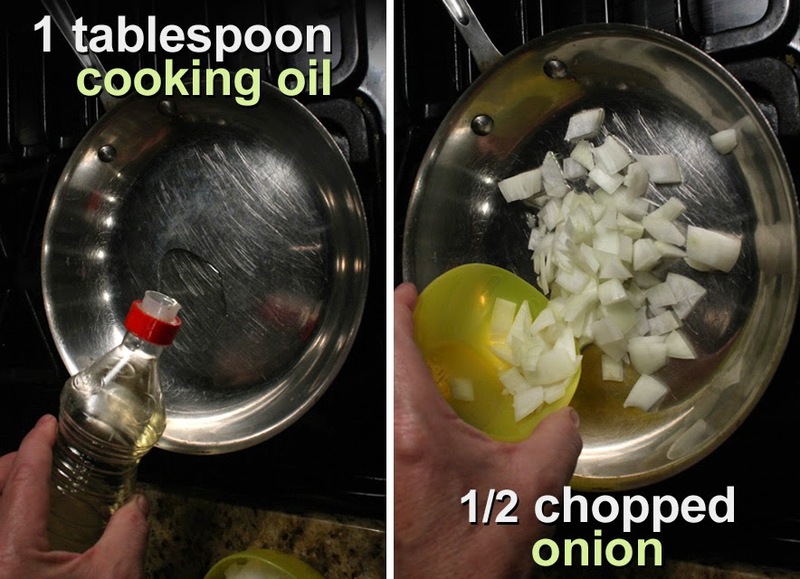 1 tablespoon oil - for frying onion and garlic. Pepper to taste - Most canned tomato sauce has a lot of salt, so I don't add any, but you can add salt, if you want. Start with the canned tomato. You can use any store bought type you like. I used a plain can of tomato sauce and added some sauteed onion, garlic and herbs. Here's how I did it. 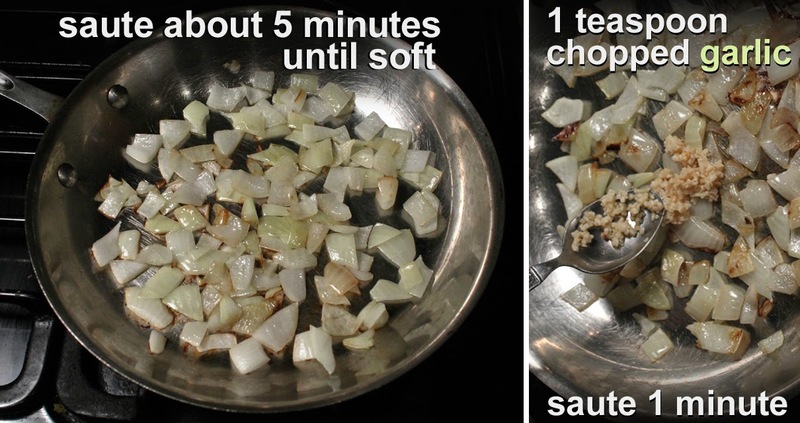 First saute 1/2 chopped onion in a tablespoon of oil over a medium heat. Cook until soft, about 3-5 minutes. Add chopped garlic and saute another minute. 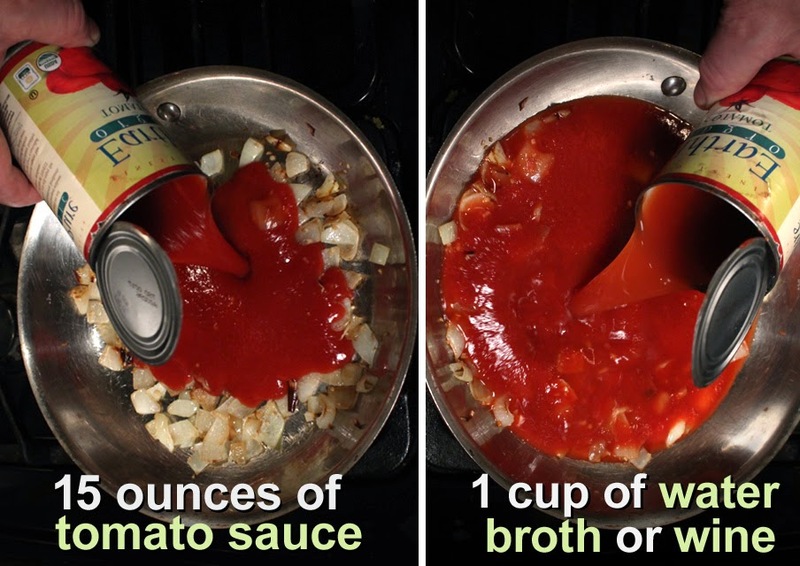 Pour in a 15 ounce can of tomato sauce. Slosh around half a can of water (broth or wine) and add it to the pan with sauce and sauteed veggies. Mix well and finally add the herbs, fresh or dried. 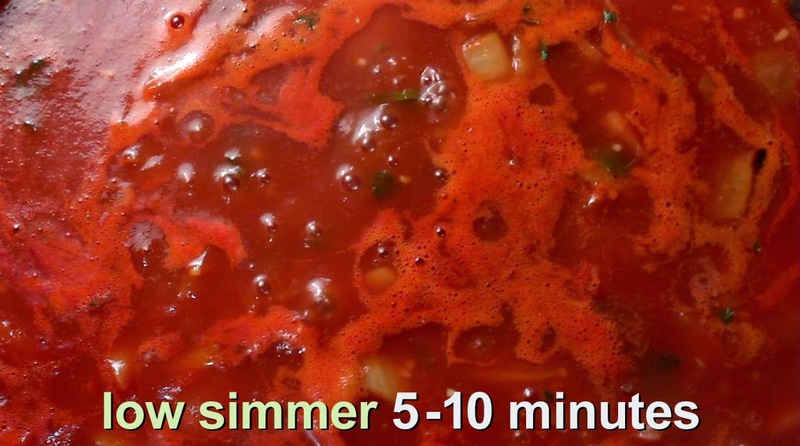 Cook tomato sauce on a low simmer. You just need to cook the pasta sauce for another 5-10 minutes, so all the flavors combine. 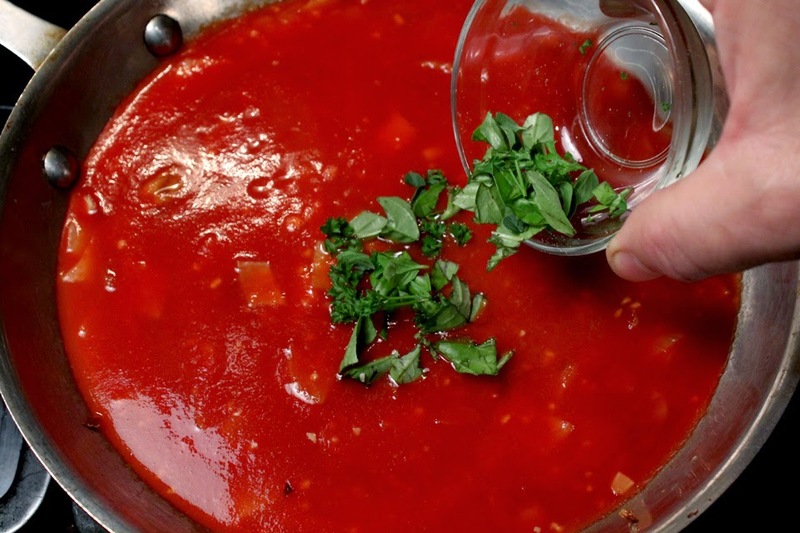 This basic Marinara Sauce can be used for any pasta recipe. 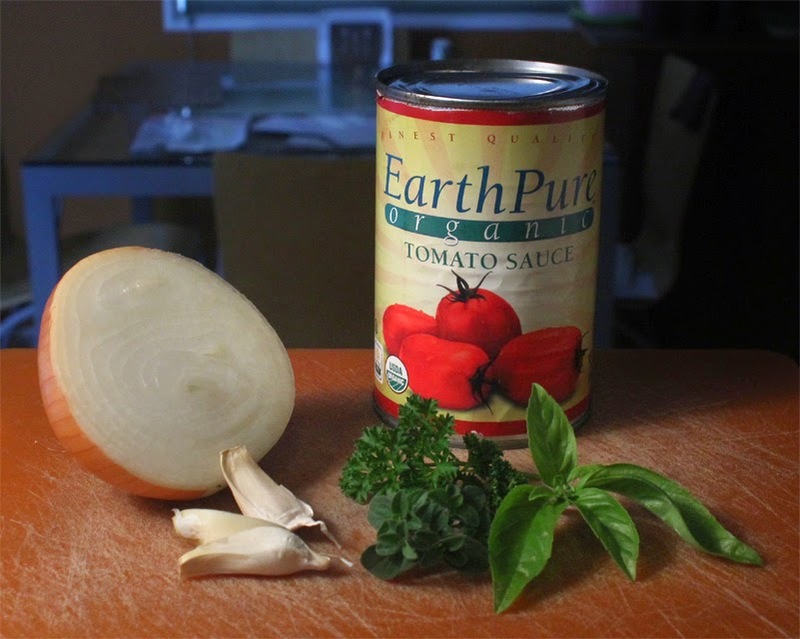 For a tomato pizza sauce, then you want to smooth the Marinara Sauce in a blender. When the sauce is cool enough to handle, just pulse it a few times to breakdown the onion pieces. This recipe is easy to double by using a large can of tomato sauce and, of course, add more of the other ingredients. And if you have a little carrot and celery on hand then go ahead and saute it with the onion for extra flavor. I don't eat Korean cuisine enough. I really like a smoky room of sizzling meat on Korean barbeque grills. It's a heavy meal when you get their Bulgogi. If you've done it, it's quite a raucous show with pungent garlic smell and sizzling meat. Usually the waiter takes your order and fires up your own personal small bbq grill in the center of your table. They return with thin sliced slabs of marinated protein, anything from beef to chicken, and pork (and a selection of veggies to grill, too.) They will get things going for you, and you finish cooking the meat to a desired doneness. But the thing I especially like are the myriad of small veggie filled small bowls that come with your meaty meal. Banchan or "side dishes" are an essential part of any Korean dining experience. Usually the veggies are pickled or lightly cooked. Gamy, spicy cabbage, called Kimchi, is the most familiar. I especially enjoy the milder spinach and cucumber dishes. I'll be cooking up a few of these Banchan for you, so keep checking back. First up is a lightly marinated Cucumber Salad. I used smaller cucumbers for this recipe. 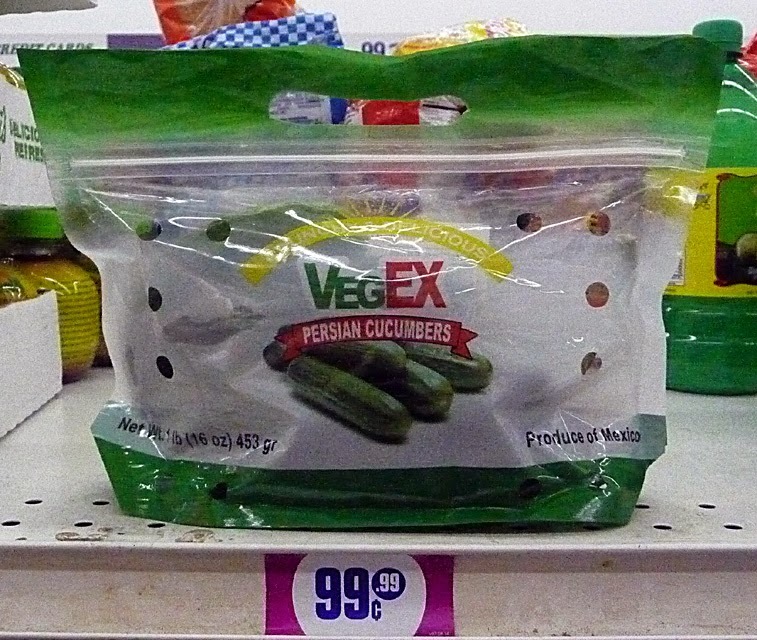 You can get them in an oriental market, but an easy substitution are Persian cucumbers, that are starting to appear at regular grocery stores. These smaller cucumbers also have tiny seeds, but still taste like the typical cucumber you can get anywhere. 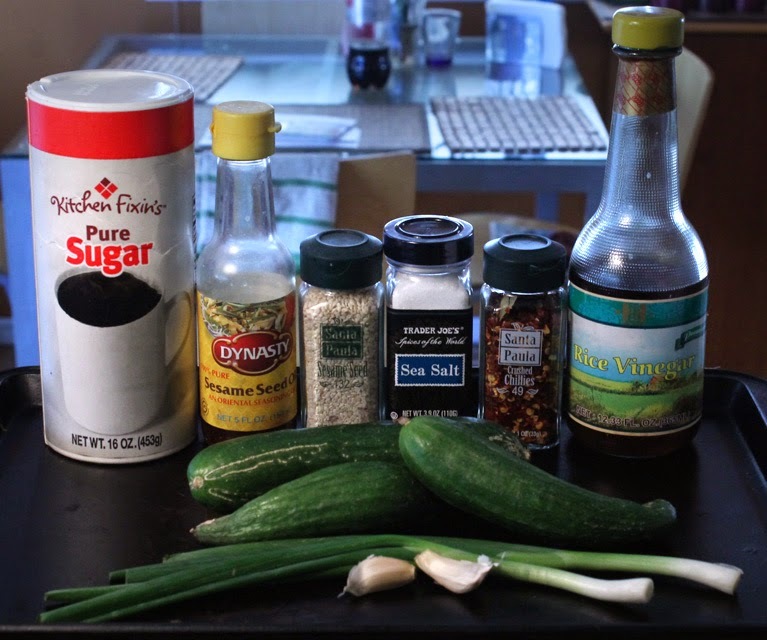 For this recipe you can use regular, or Korean/Persian cucumbers. My local 99c only Store sometimes stocks one pound bags. The other ingredients are cheap, too, just a little garlic, green onion, vinegar, oil, sweetener, and some sesame seeds. 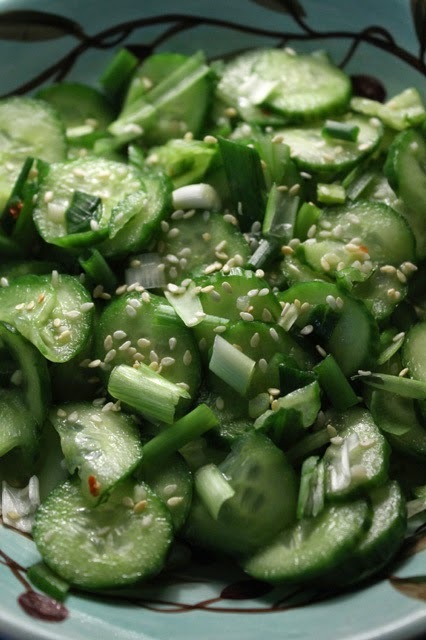 Some recipes call for salting the sliced cucumber and let them "sweat" to remove excess liquid. I don't go that far. I really don't see the point, as the sliced cucumber is in a liquid of oil and vinegar anyway, so a little extra "water" is not a problem, really. 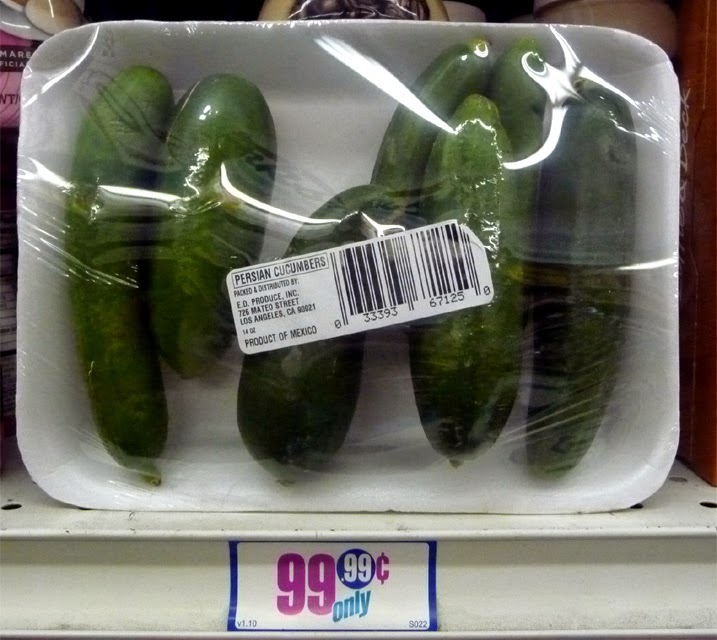 And you can drain the Cucumber Salad before serving. Recipes also call for a Korean chili sauce, but I use a few chile pepper flakes instead. 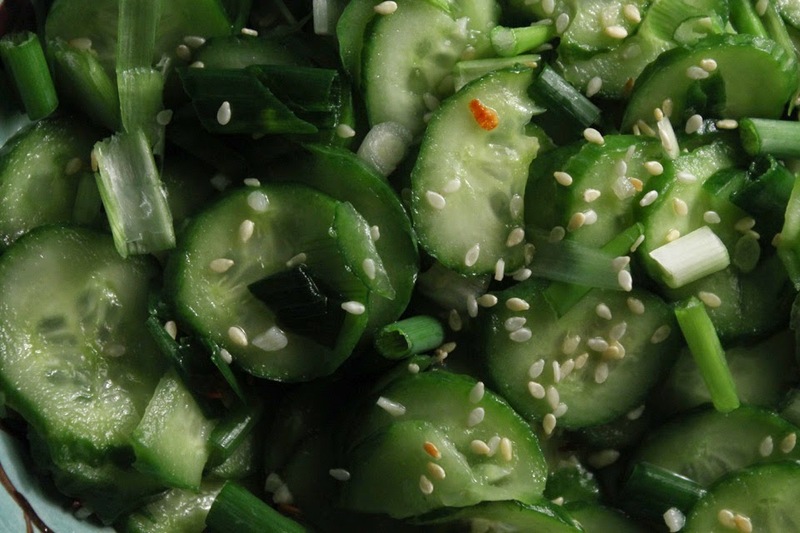 This is a refreshingly light small Cucumber Salad I think you will enjoy anytime, whether you're in a smoky Korean restaurant, or just kicking back at home. 1/2 pound of cucumber - I used 3 small Persian cucumbers. It's okay to use 1 regular large cucumber. 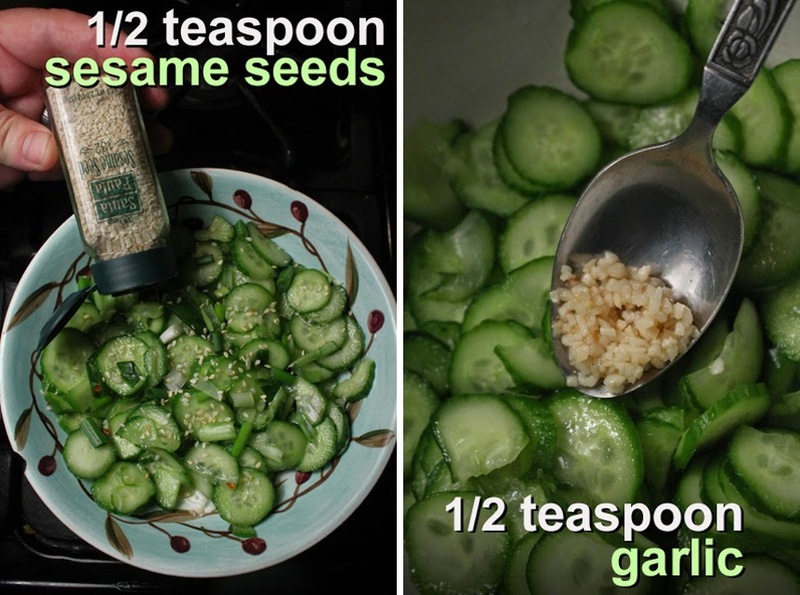 They both taste the same, the main difference is seed size, Persian cucumbers have very small ones. 2 green onions - chopped. 1/2 teaspoon garlic - chopped. Fresh or from jar. 1 tablespoon rice vinegar - okay to use any favorite. 1 teaspoon sesame oil - okay to use any favorite tasty oil. 1/2 teaspoon sugar - or any sweetener. Okay to add more to taste. A small sprinkle of red chile flakes - optional. Even 4-6 pepper flakes is enough, especially after some marinating time has passed. 1/2 teaspoon of sesame seeds - When serving sprinkle on a little bit more for appearance. Simple really. 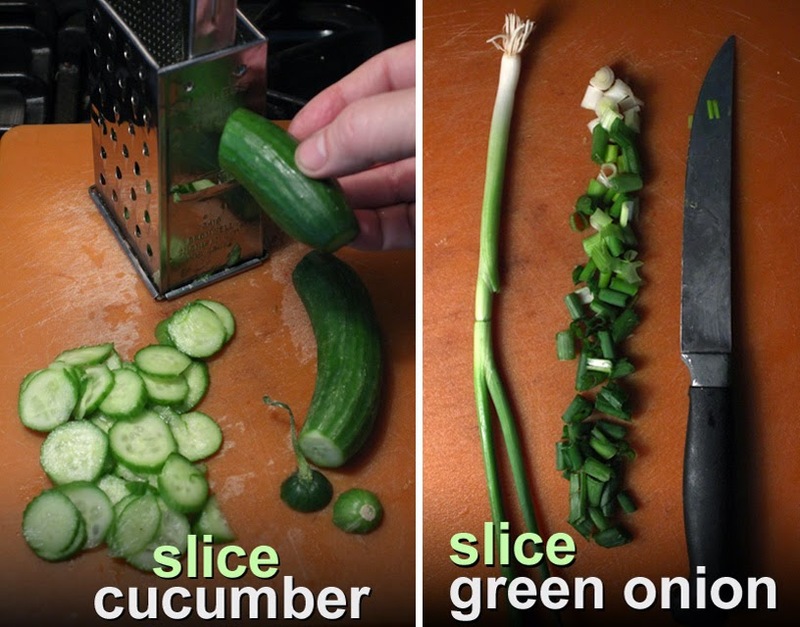 Thinly slice cucumber. I used the slicing part of my metal box grater, but you can do it with a sharp knife, too. Slice 2 green onions. Discard any yellowing greens stem parts and the white root. Add veggies to a bowl. Add sesame seeds and chopped garlic. Drizzle on rice vinegar and sesame oil. Mix it all together. Refrigerate until ready to eat. Okay to drain some excess marinade when serving. This internet chef does not live by publishing recipes alone. Nighttime photography is also my thing. Give me a tripod, a digital still camera, four wheels and a quarter tank of gas, and I'm ready to hit the neon lit streets of Los Angeles. My Restaurant Nocturne Series is half art and half food blogging. As dust approaches, I usually have a handwritten list of about four or five restaurant destinations. On most outings I'm lucky to shoot two or three. That's the way it goes. I go to a dining destination and it may have a bunch of cars blocking my view, or it's a slow night and nobody is eating out there. I gotta have some people entering or leaving the restaurant I am shooting, or there is no Restaurant Nocturne; I'll pack up and head to the next one on the list. Customers give scale and meaning to my nighttime photography; without them it's lifeless - that's the way I roll. Rejected photo - will try again when there are less cars out front. But it's all good. If I don't get it that night, I'll be back. Usually I can, at the very least, corral someone to recite the menu for my audio, either the maitre d' or, waiter or even a satisfied customer, and, sometimes if I'm lucky, the chef. And if nothing else, I know where to park next time, and I have the composition figured out, as with the photo of Night + Market Song above. Sometimes it takes five minutes to shoot a Nocturne, sometimes I'm there for 45 minutes - all depends if and when people walk through the frame. I'm not a paparazzi (as I'm often mistaken to be) shooting celebrities out on the town. Usually, I'm out front somewhere, on the sidewalk, or across the street with my tripod and camera. Sometimes the maitre d' will come out and shoo me away -- well, as long as I'm not on private property I can continue shooting the restaurant. Hey, I get it, I can see their point of view; customers are out to dine, not end up in someones photograph. That's the contradiction and controversy of street photography. I'm first and foremost an artist, so I have a bit of leeway - that's what I keep telling myself. (Although, when shooting in a mini-mall I am on private property, so I have to depend on the whims of security guards or parking attendants.) My final outcome is not to embarrass anyone or make the restaurant look bad. I'm just documenting Los Angeles's nocturnal dining scene, from street level. Lately, I've been letting the appetizing audio have more time. I used to cram too many restaurant video clips into a typical Restaurant Nocturne, now I have fewer. But, I think it's important to let the menu audio breathe. Fine dining in mini-malls, that's the way we roll in Los Angeles. For Restaurant Nocturnes XIV, most of the cafes I shot are located in grubby Los Angeles strip malls, from Hollywood to Koreatown, and Silverlake (except the last restaurant, Little Jewel.) I didn't plan it that way, it just happened. You'd be surprised at the quality of dining that's thriving in these nondescript tacky locales. Why are ambitious and creative new restaurants popping up in mini-malls? Cheap rent, that's why. Mini mall with Petit Trois & Trois Mec. Click on the photo to see full size. A couple of the most hippest and written about eateries are next to a doughnut shop and dry cleaners, in the photo above. ABC's The Taste judge/mentor, Frenchman Ludo Lefebvre, opened two restaurants in the last year (along with partners, chefs Jon Shook and Vinny Dotolo of Animal,) at a Hollywood mini-mall near the corner of Highland and Melrose Avenues. 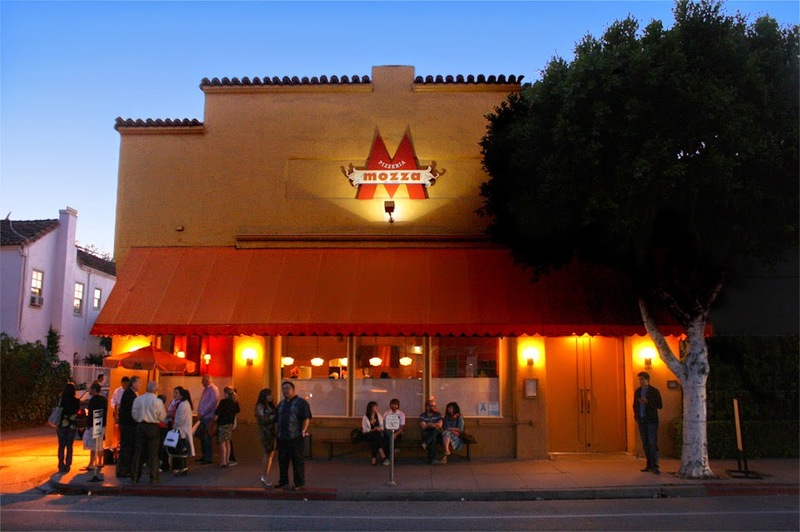 As a contrast, across the street and down half a block is the eating emporium, and decked-out Mozza, helmed by Nancy Silverton (named 2014 Outstanding Chef by the James Beard Foundation,) in partnership with Mario Batali and Joe Bastianich. When you go to Ludo's Trois Mec down the street, just drive into the mini-mall with the donut shop -- and try finding it. There's no Trois Mec sign. The sign you are looking for is a pizza sign called Raffallo's Pzza (sic) with a yellow "OPEN" arrow, that's your destination. Go figure. I think Ludo has a perverse sense of humor, and I like it! Controversially, he and his wife have instituted a prepaid, no-cancellation, reservation system, where you call 2 weeks ahead to get a seat. And you better call promptly when seats are released 8AM every other Friday morning, because they sell out in minutes. That's Chef Ludo Lefebvre taking a cell phone break. 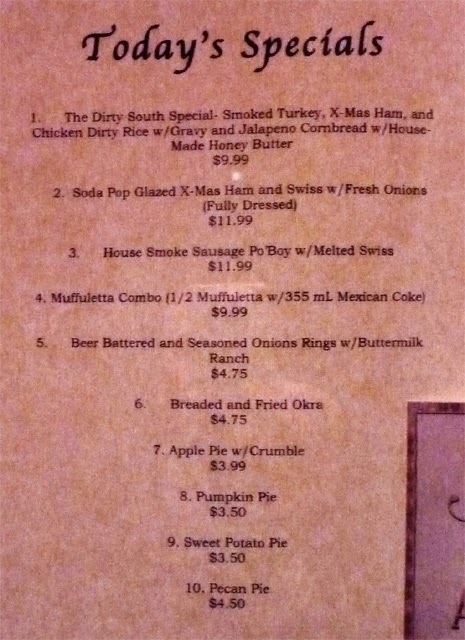 Ludo's menu there is cutting edge, changes constantly, and makes Top Ten lists in all the local food media. Just listen in to the entree ingredients in my video - Eggplant Mole with Charred Onion, anyone? Right next door to Trois Mec is Chef Ludo's version of a Paris Bistro, Petit Trois, that serves the perfect omelette with Boursin cheese sauteed in lots of butter, and Steak Frittes with a well-curated glass of wine. And recently Petit Trois is serving fois gras, since a federal judge struck down California's ban on the duck liver delicacy. The menu changes and it's not listed online, so you have to drop in to see what French cuisine is being served this month. (It's funny, but while I was gathering the menu audio there, people kept entering Petit Trois asking for the location of Trois Mec. The waiter had a ready quip to send them on their way next door.) 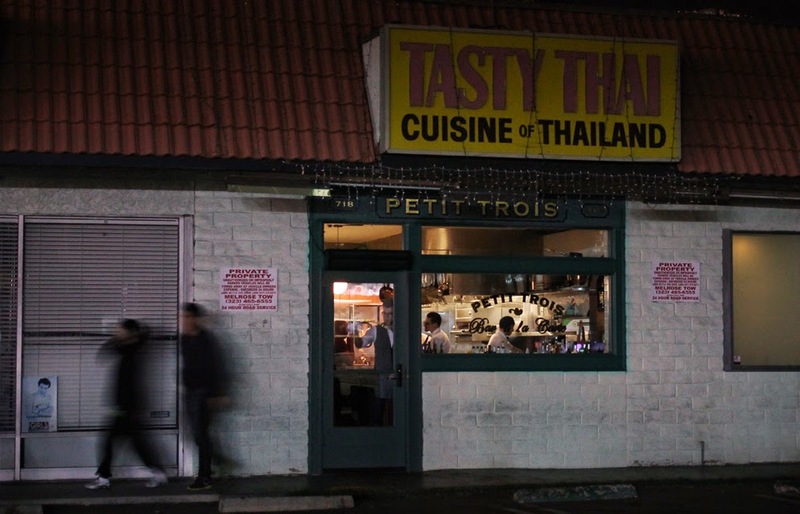 And Petit Trois has a legible and legitimate sign...under the previous owners Tasty Thai sign. 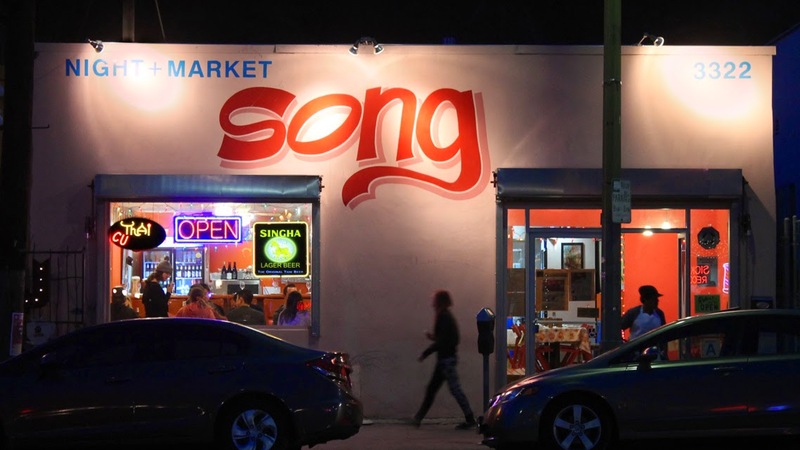 In Los Angeles's grooviest neighborhood of Silverlake is another mini-mall dining destination, Pho Cafe. Like Trois Mec there's no sign, just the deteriorating street address stenciled on it's window facade. But you know somethings going on here when the dining tables are full of fragrant steaming bowls, along with a chatty sidewalk queue out front. Pho (pronounced like fuh, or duh with an f) is a watery, but, deeply flavored beef broth with silky noodles topped with fresh herbs. There is a selection of meat to add, like: chicken, thin sliced beef, tendon and meatballs. The Pho Cafe is a bustling neighborhood hangout specializing in this Vietnamese specialty. Next up is Saint Martha, named after the Patron Saint of cooks and servants. The restaurant actually has a sign! It's located in Koreatown on Western Avenue, in a two story strip mall, along with all types of Korean businesses and Oriental eateries. The exterior may be 1960's blasé architecture, but the food at Saint Martha is Modern American cooking by Chef Nick Erven. Ingredients change with the seasons, so expect the unexpected. Saint Martha has been open only a few months, but it's already on many Top Ten Lists. And make sure to listen for the tasty sounding entrees in my video below. 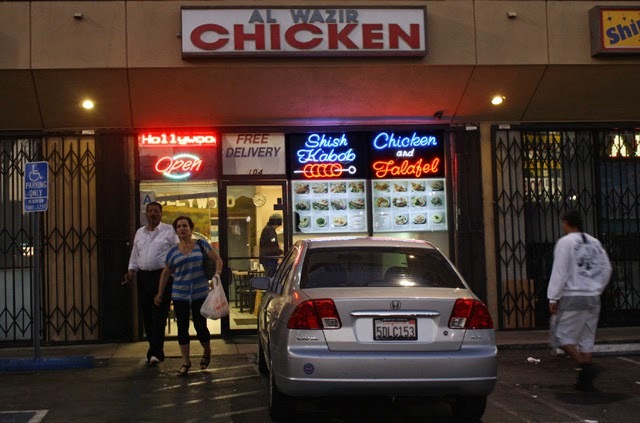 You want cheap, well I got it here at Al Wazir Chicken. I love Middle Eastern rotisserie chicken. And at this no-nonsense eatery with formica decor, you get a whole chicken with pungent garlic sauce and pita bread for about $10. Now, my go-to rotisserie chicken is from Zankou Chicken, an LA dining institution down the street on Sunset Boulevard, but as a backup, this is a fine substitution. It's in my old neighborhood of Little Armenia on Hollywood Boulevard and Gower Street, and, of course, it's in a mini-mall (where I used to get my prescriptions filled in an upstairs Farmacy - since closed.) Loaded Shawerma Pita Sandwiches of marinated slow cooked chicken, beef and lamb, go for $4-$6. And there are Middle Eastern vegetarian sides of Hummas, Stuffed Grape Leaves, Baba Ghannouj and Tabouleh. Anytime a Cajun eatery opens I'm there. And Little Jewel is my type of dining joint. The final Restaurant Nocturne is not located in a mini-mall, but is in Chinatown?!! Well, that's no big deal, located right down the street is the originator of the French Dip sandwich, Philippe the Original. I went to high school in Louisiana so I am well versed in small, neighborhood markets and gas stations with a sandwich deli in the back. 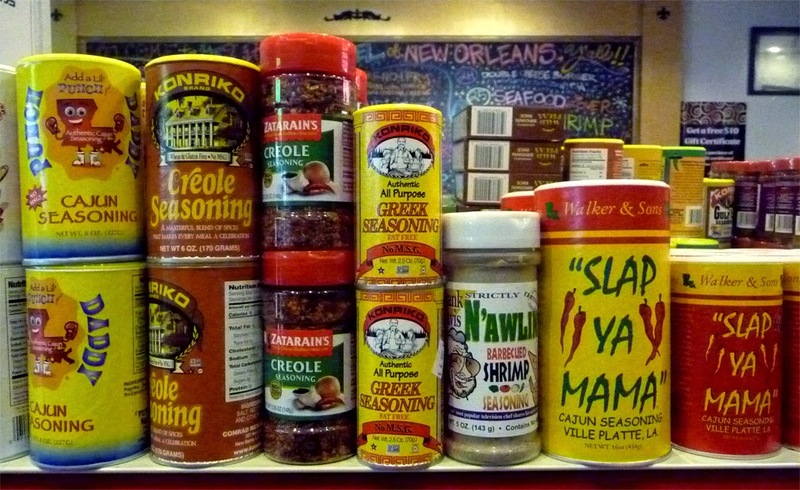 This is the real thing and Chef Marcus Christiana-Beniger stocks the market with all manner of hot sauce and Creole seasoning, pickled veggies, Zapp's Potato Chips, Camellia Beans, Community and Cafe du Monde Coffees, and even packages of ramen for the locals. He know his stuff, as he was born, raised and worked in restaurants all around New Orleans. But, it's really all about authentic Cajun food here. Marcus concentrates on over-stuffed Po' boy Sandwiches, but he's expanding the menu with daily specials that include: Gumbo, Jambalaya, and other Cajun delicacies. He also cures and smokes sausages over pecan wood, in the back, like: Boudin, Andouille, Chaurice, Hot Sausage and Tasso. 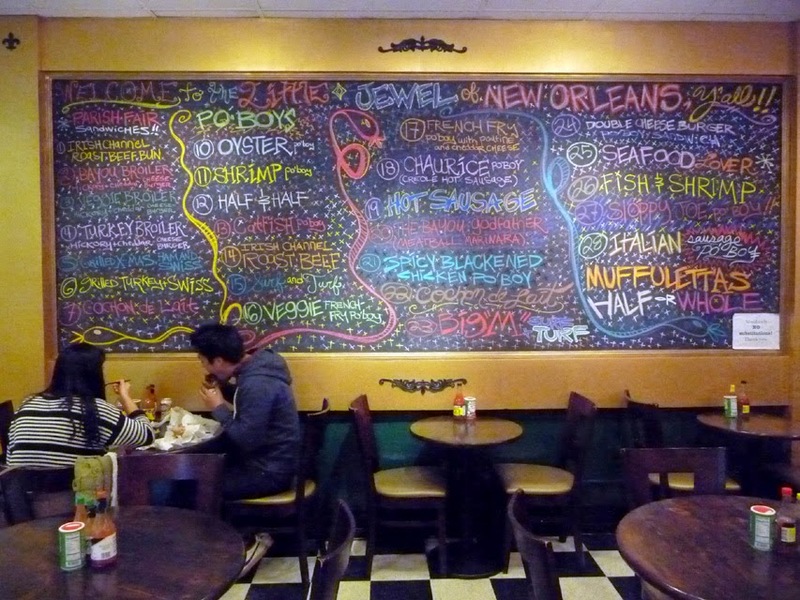 The Po' boy menu is expansive with fried Oysters, Shrimp, slow-cooked Pork and Beef with Debris Gravy. Chef Marcus is Italian, so, of course, he makes a mean Muffuletta Sandwich, which is a stacked Cajun/Italian coldcut deli sandwich smeared with a house-made olive salad. He uses Leidenheimer, a New Orleans French bread, for his sandwiches. To quote Marcus: "And quite honestly, I would not have done this place if I couldn't have got that bread." Be sure to listen to our colorfully profane, wacky chat, while I was shooting Little Jewel in Chinatown. Marcus drops a few f-bombs, but it's all in good humor. Play it here. Video runs 7 minutes, 46 seconds. Restaurant Nocturnes I, Restaurant Nocturnes II, Restaurant Nocturnes III, Restaurant Nocturnes IV, Restaurant Nocturnes V, Restaurant Nocturnes VI, Restaurant Nocturnes VII, Restaurant Nocturnes VIII, Restaurant Nocturnes IX, Restaurant Nocturnes X, Restaurant Nocturnes XI, Restaurant Nocturnes XII. Restaurant Nocturnes XIII.